Bring all of the glitz, glamour, and movie-making magic of Hollywood straight into your Sims’ homes with The Sims 3 Movie Stuff! Set the stage for more unique stories with distinctively themed décor, furnishings, and clothing inspired by iconic movie genres. Fashion—Whether you’re creating a caped do-gooder or a nefarious über-villain, your Sim is going to look absolutely super in a range of tight-fitting, over-the-top costumes—including the mighty and mysterious Super Justice Llama! Décor—Create a lair or hideout fit for a masked hero or even their arch nemesis with sculptures, memorabilia and more inspired by the greatest comic-book hero movies. 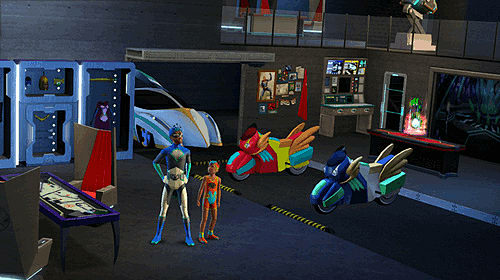 Your Sims can even feel like they’re about to resume their secret identity in their new phone-booth shower! Fashion— Time to rustle up some new duds, I reckon. 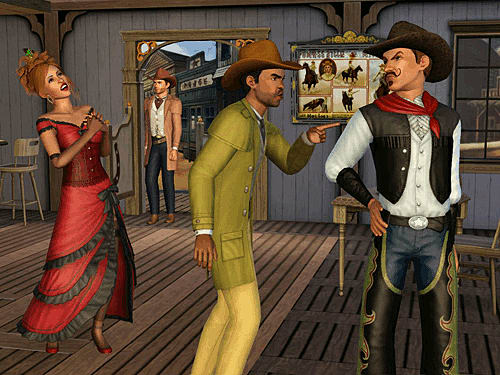 With frilled chaps, smart vests, and ornate Victorian dresses, your Sims will look like they’d be right at home in some dusty Western saloon. 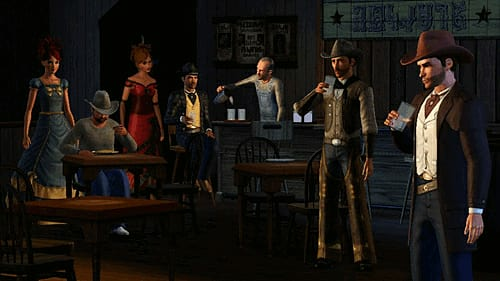 Décor— Give your Sims’ home a folksy frontier attitude that says, “Howdy, partner.” Old-timey furniture like a wooden vanity and a homey rocking chair will add some classic Western style to your Sims’ world. 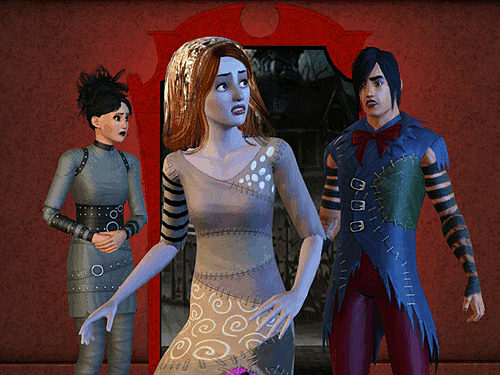 Fashion—Terrify your Sims’ neighbors with playfully horrific costumes. Gothic garb includes selections in macabre colors like black and crimson with features such as prominent stitching, and lots of rips and tears for that just-risen-from-the-grave look. Décor— Your Sims are in for some scare … with flair. You’ll have a frightfully good time decking out your Sims’ homes in cheeky horror décor including a nightmarish bookshelf, a spider web door, and jars of who-knows-what. Top off your Sims’ cinematic look with a selection of show-stopping headgear and hairdos. From a winged hero helmet to an expertly tangled gothic ‘do to a ghostly bridal veil, your Sim will look ready for their close-up.